Globalization seems to be taking a hit in many respects, with persistently weak global trade growth, rising protectionism, and increasing anti-immigrant sentiments in markets around the world. How can CFOs find global growth opportunities? Foreign direct investment (FDI) offers one compelling strategy in this increasingly complex environment. Each year, A.T. Kearney, a global management consulting firm, publishes the FDI Confidence Index, a forward-looking survey of global business executives that ranks which markets are most likely to attract the most investment in the next three years. In this year’s survey, investors told us that they view the global economy and their investment decisions as a glass half full. First, we have the “half full” indicators. Last year, investors’ outlook on the global economy was the most bearish we had seen it in many years. About half were more pessimistic about the global economy compared with the previous year. This year is a somewhat different story. Investors’ traditional optimism is back, with 60% of more than 500 global investors more optimistic about the global economy than they were last year. We also see continued bullishness on the prospects for FDI. Last year, 71% of more than 500 investors told us that they planned to increase their levels of FDI. This year’s response is even more emphatic, with 75% of investors indicating that they plan to increase FDI in the coming years. We take this as a positive sign that strengthening economies around the world will be supported by higher business investment, perpetuating economic growth. That is the “half full” story that investors told us. But there are other results from our survey that keep the glass from filling all the way up — our “half empty” findings. In recent years, factors related to market assets, such as the size of the domestic economy and the labor force, and infrastructure quality have topped investors’ list of considerations when determining where to make their investments. This year marks another substantial change. 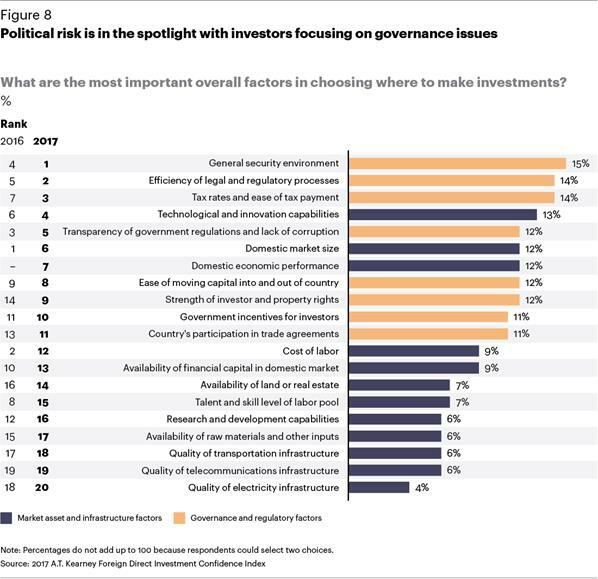 The top three factors are all related to governance and regulations, as are seven of the top 10. (See Figure 8, from the study.) This as an indication that political risk is increasingly top of mind for investors when assessing the attractiveness of a market. Another “half empty” finding relates to the wild cards that investors see as likely to happen this year. 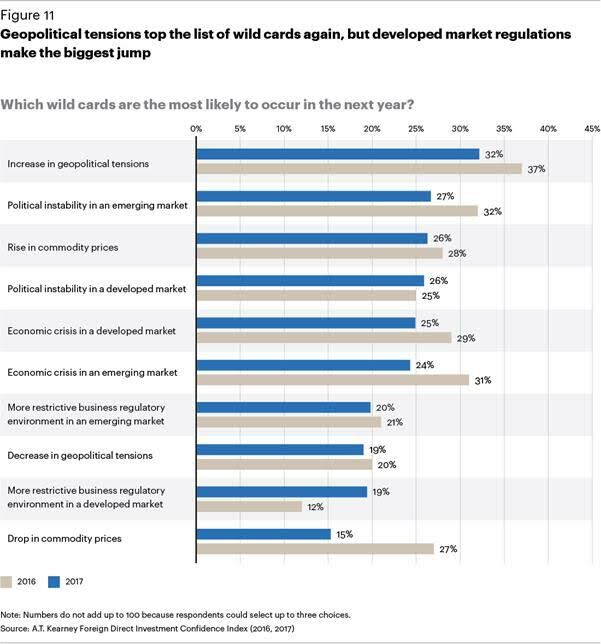 For the third year in a row, an increase in geopolitical tensions tops the list of likely wild-card risks in the external environment. (See Figure 11.) Investors are understandably nervous about the growing number of significant geopolitical flashpoints — from the Middle East to Eastern Europe, and from Southeast Asia to the Korean Peninsula—and how they might hinder cross-border flows. Net net, these conclusions about the global economy and investment environment present a challenge to CFOs, as they represent neither a retrenchment nor a “full-steam ahead” business mindset. The global economy is strengthening, but political risks are rising. How can CFOs square this circle and generate business growth? Deploying FDI represents an important localization strategy. While a government may seek to limit imports, foreign companies with a local presence in the market are already in — and likely provide local jobs as well. Therefore, FDI may become crucial to maintaining access in large markets that risk turning inward. And more broadly, after years of subpar economic growth and lower levels of FDI, the quality of investment targets and the macroeconomic environment are improving across markets. We see evidence of this strategy in our FDI Confidence Index survey. Last year, we saw that a combination of methods was the most popular approach to FDI. This year, joint ventures and mergers and acquisitions are the most popular forms of FDI—which makes sense in the current geopolitical environment. With nationalism and protectionism on the rise, JVs are likely to be viewed most favorably by governments that are keen on boosting domestic production and employment. While M&As imply greater ownership and control by a foreign company, the resulting enterprise could retain its historical branding and thus could continue to be perceived as more local than foreign. Two examples of this dynamic in this year’s FDI Confidence Index stand out: in the United States and members of the European Union. In addition to the overwhelmingly positive investor outlook for the U.S. economy, while it’s still too early to know, the protectionist and “buy American” rhetoric from President Trump could be motivating investors to gain a toehold in the U.S. market. The Brexit vote might also be motivating investors’ FDI intentions across Europe, fueling the rise in the Index rankings of countries such as Germany, Sweden, Italy, and Ireland. Yet the United Kingdom also fared well in the Index, suggesting some investors may also be seeking a foothold there to hedge their bets in a post-Brexit Europe. Capitalizing on an expanding global economy to achieve business growth while mitigating political risks to business operations and profits is no easy task in the current environment. But corporate investors from around the world seem to be using FDI as a strategy to hedge against weakening international trade and globalization. CFOs should take note of this shift and determine if a similar strategy would yield positive results for their companies. Paul A. Laudicina is a partner and chairman emeritus of A.T. Kearney. Erik R. Peterson is a partner at the firm.